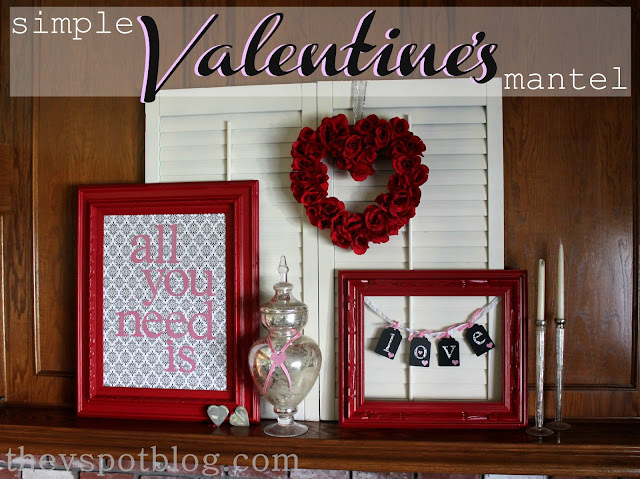 A simple Valentine’s Day mantel. I wanted to show you what I came up with for a little Valentine’s Day display for my nemesis, the mantel. (I was going to post this yesterday, but I went with some healthy habits instead…) I have the worst time with the proportions of this room, but I’m fairly happy with this fun and simple Valentine’s Day Mantel. Mercury glass, chunky wooden frames, shutters and sparkle. That kind of hurts my brain to think about that mix, but it doesn’t hurt my eyes, so I’m sticking to it for a few weeks. 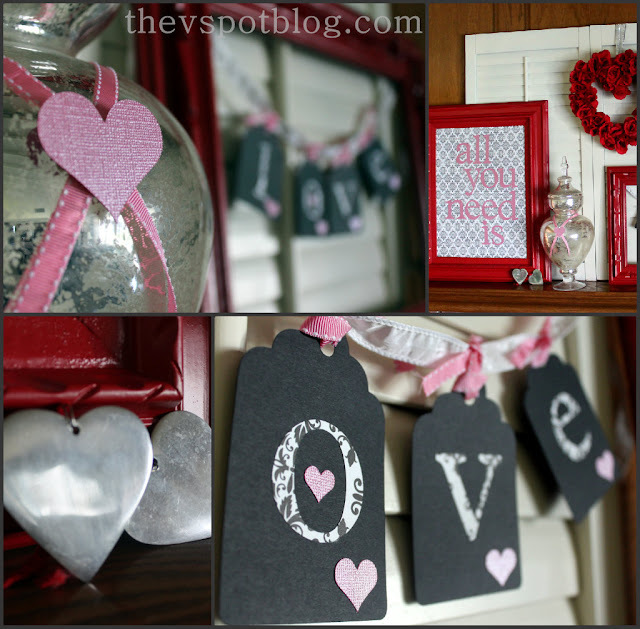 The little all you need is… art piece was made out of scraps and left-overs in my craft supply stash. Was super easy to do and it’s totally temporary. I am so lazy that I didn’t even bother to cut off the ends of the paper. Once the board was covered, I cut out letters on my Cricut (And yes, you could buy pre-cut ones at the craft store of your choice.) I eye-balled the letters into what looked like a balanced position then adhered them with a glue stick. Easy. It looked pretty good during the day, but in the evening there wasn’t enough contrast, so HH got a Sharpie and carefully outlined them to add more contrast. Do you decorate for Valentine’s Day, or are you still cleaning up pine needles? I have had my Valentine’s day decorations up for a couple of weeks now, I needed the love! Love that HH helped you out, mine would have simply said, “it looks good Babe”. How big is that red frame??? I thought it was like 11×14 but HH looks really small there so I’m thinking bigger. I really love what you did on your nemesis. I am still cleaning up pine needles. I gave up on anything for Vday in the form of a decoration. Easter is coming! Cute! I’m not a fan of Valentine’s Day since I was born that day and am scared for life because of it BUT I think your simple mantel looks great without going overboard. Love it!! Also, LOVE the wreath!! Did you make it? Wow! I don’t think my husband would dare outline something like that for me. I love your mantel! i need to decorate for valentines day still. Loooove that frame, so cool painted red! I love how this turned out! My next house MUST have a mantle. Holiday decorating using your own photos. 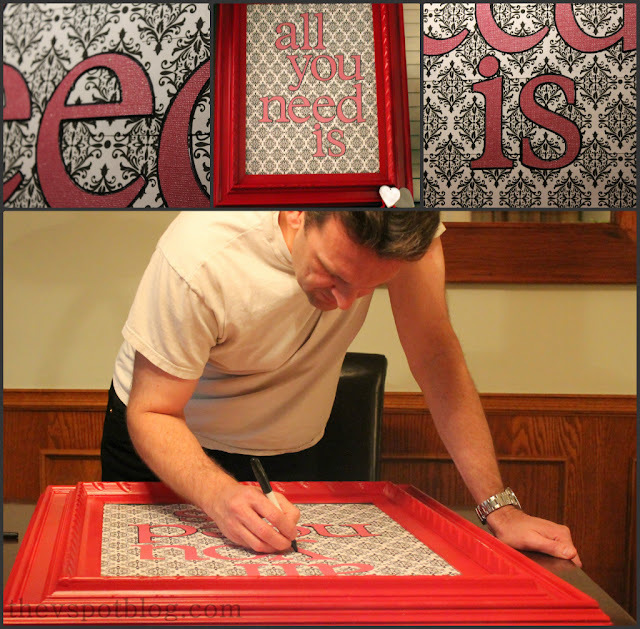 Handmade Valentine’s Gift… a relationship timeline.